This influential article by Richard Levins originally appeared the Puerto Rican left journal La Escalera in 1966. It is available now as two free downloads. The forthcoming bilingual pamphlet will include the original Spanish version, a translation by Aurora Levins Morales, a preface on the continuing significance of the work, and historical notes. In November of 1965, leftist students and faculty at the University of Puerto Rico main campus in Río Piedras organized a teach-in on the Viet Nam war. University authorities forbid speakers to come onto the campus, so students gathered inside the fence, while speakers climbed a ladder leaning against it from the outside. 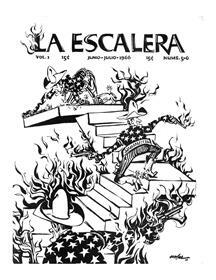 La Escalera (The Ladder) was founded shortly afterwards. It was independent left journal, publishing political writing, including satire, and with cover illustrations by prominent Puerto Rican graphic artists like Lorenzo Homar. De rebelde a revolucionario appeared in the April, 1966 issue, and was widely circulated and discussed. Nearly half a century later, the points it makes are still extremely relevant.